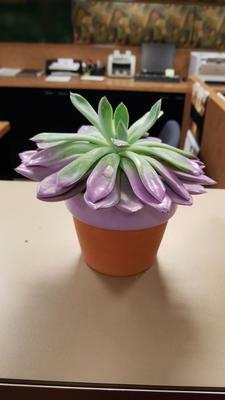 would like to purchase this succulent for our daughter; however, the teller in the bank who "owns" it doesn't know the name of it. Hoping you can help. This is some kind of Echeveria - there are several that get this treatment, through no fault of their own. This is not how they're supposed to look. For some reason, there's a trend where growers have gorgeous succulents, but then dip them in paint. As you can see, this one is growing out of it, and reverting back to its original green. For more on this genus, this page tells you about many different kinds to look for. Join in and write your own page! It's easy to do. How? Simply click here to return to Ask Your Question.